So often the noise and clamor of the demands of our daily lives drowns out this voice within us. If you are unable to visit me for a private consultation you can have a Online Card Readings right now using Psycards. Psycards use symbols, which will allow you to reach your inner voice, to reach your true feelings and thoughts more easily. Michael Joseph is available on a daily basis to respond to Online Consultations. If a client requests a consultation that lives outside the GMT time zone a small time delay may occur. If you have any further questions please read our faq's page. Michael Joseph uses the PayPal system; you will require your credit card details. 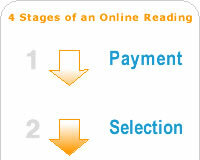 In order to use the Online Card Reading you must have the free Flash Player version 7. © 2005 Michael-Joseph.com All rights reserved.